What are your best performing Tweets? How many new followers did you get last month? What days of the week do you get the most engagement? With a Twitter dashboard, you can easily answer all of these questions and more. It’s surprising how many businesses have no idea whether or not their Twitter management strategy actually working. Some businesses look at their follower count as the main determinant of how successful they are on Twitter. Getting more followers is nice, but are they engaging with your brand? Are you replying to incoming Tweets? What’s the difference between your best performing Tweets and the ones that fall flat? Using a Twitter dashboard will give you all of this data, which you can use to grow your account even more. Need even more resources? See our complete guide to social media for small business! What is a Twitter Dashboard? 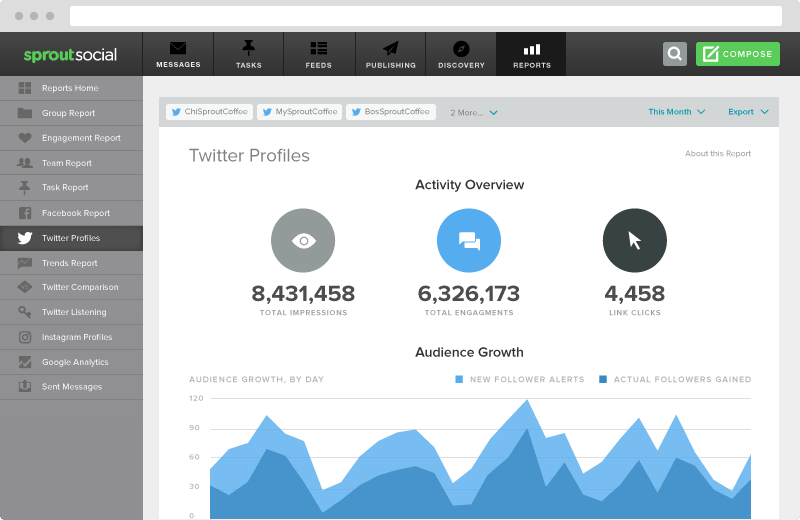 A Twitter dashboard provides you with stats and data on your activity, profile and followers. Everything is organized into graphs and charts so it’s easier to analyze. There are several different companies that offer Twitter dashboards. Twitter made big waves earlier this year by releasing its own tool, aptly named Twitter Dashboard. Twitter’s tool was made for small businesses who currently don’t use any type of dashboard or reporting. 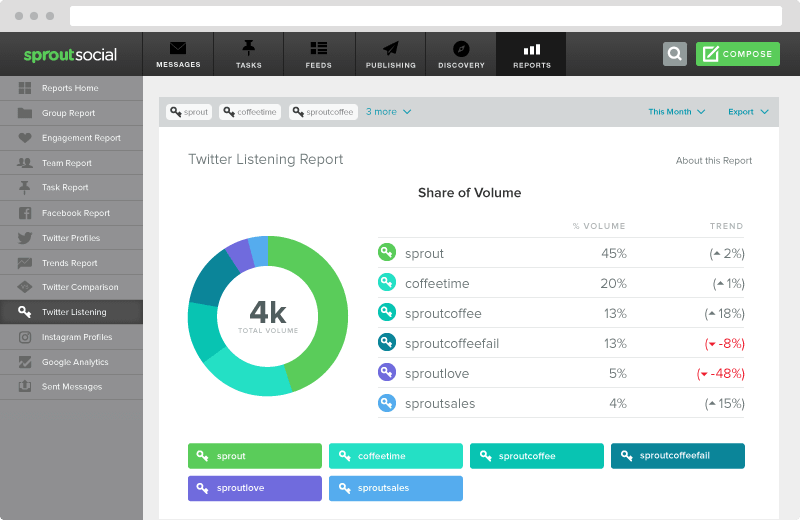 At Sprout Social, we have a very robust Twitter dashboard that’s perfect for businesses of all sizes. 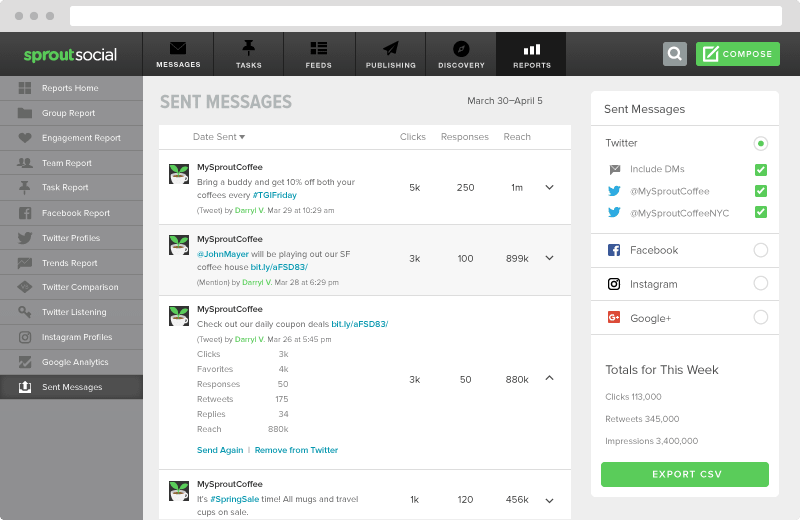 You can see account growth, your top performing Tweets, what types of Tweets you’re sending and a lot more. If Twitter is one of your primary social media marketing channels, the data you get from Sprout Social’s dashboard is extremely beneficial. There really isn’t a good way to track your Twitter activity without using a dashboard. Spreadsheets just aren’t going to cut it. If you have multiple Twitter profiles or want to track your other social media accounts, a dashboard is a necessity. You never have to worry about trying to find a specific data point because all your metrics and reports are accessible from a single location. On top of organizing your data, your dashboard also keeps your Tweets and incoming messages organized as well. Instead of seeing a stream of all the latest Tweets from everyone you follow, you can filter your view to only see Tweets relevant to your brand. The native Twitter app isn’t made for businesses, it’s made for casual users. It’s perfect for people that just want to Tweet on the go. But as a business, you need the ability to schedule Tweets ahead of time and put together a complete social media editorial calendar. For that, you need a Twitter dashboard. You can–and should–Tweet in real time as well. But having Tweets scheduled for the week or month allows you to Tweet around the clock, which creates consistency. When you’re trying to send every Tweet manually, you’ll likely end up with long spans of time where you’re not Tweeting anything because you’re busy or just forget. 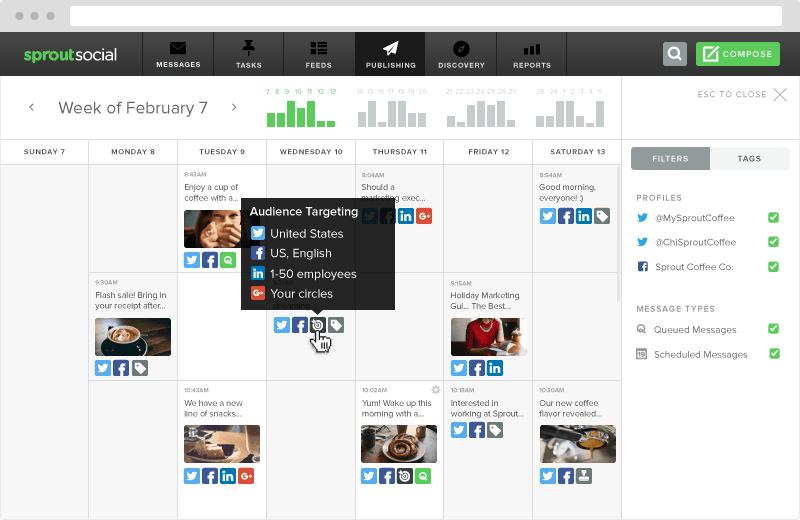 Stay prepared by using your dashboard to schedule Tweets ahead of time. Some companies have multiple people managing their social media accounts. A Twitter dashboard makes collaboration possible because everyone doesn’t have to log into the same Twitter account, they just log into the dashboard. You can also track which team member sent which Tweet. If you have more than one person managing your social media marketing, a Twitter dashboard is a must-have. This is probably one of the top reasons businesses use a Twitter dashboard. In a survey from Convince & Convert, 41% of companies said they had no idea whether or not their social media marketing was actually paying off. If you’re not measuring your efforts, you’re going to fall under that umbrella. With a Twitter dashboard, you’ll get plenty of reports to help track your Twitter activity. Keep in mind that not all Twitter dashboards are created equal. Some dashboards only provide very basic analytics. With Sprout, you get very in-depth reports with data your business can truly act on. Check out what’s included in our Twitter Analytics here. Are you making assumptions about what type of content resonates with your audience? Some businesses make the mistake of guessing what their followers want to see. However, the best way to find out what type of content your followers like is to monitor which Tweets are getting the most engagement. Use your Twitter dashboard to find which of your Tweets receive the most Likes, Retweets and replies, then start sharing more content about those topics. 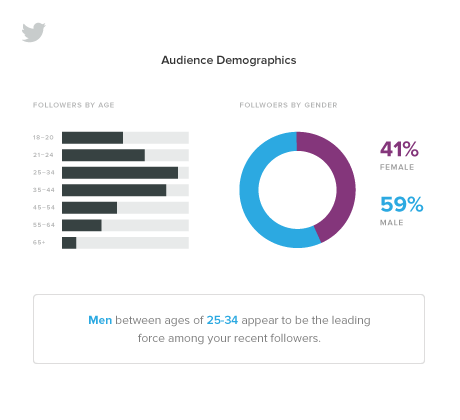 One cool feature in Sprout’s Twitter dashboard is the ability to see your audience demographics. The more context you have about who’s seeing your Tweets, the better you can target them with your content. The way your brand communicates with a 54-year-old male will likely be different than how you would with a 20-year-old female. Use your Twitter dashboard to find out who your audience is, and tailor your Tweets to them. Twitter is huge for social customer service. Aside from embarrassing social media mishaps, one of the worst things brands can do is completely ignore their fans. Our 2016 Q3 Sprout Social Index found nearly 25% of social media users are annoyed when brands don’t reply to their messages. Since Twitter’s native timeline moves so quickly, it can be very difficult to keep up with all the Mentions your brand receives. Plus you may not have the context for a conversation. For instance, if someone Tweeted your brand about a problem three weeks ago, you may not remember them if they sent a new Tweet today. 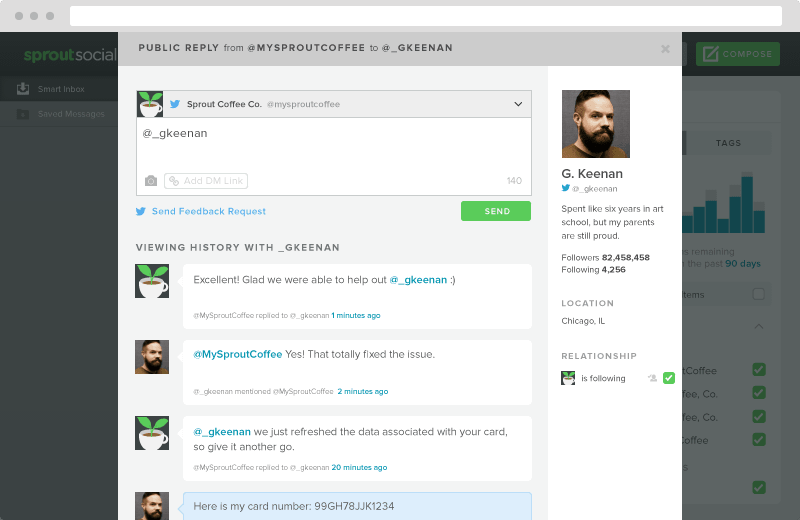 With Sprout’s Twitter dashboard, you can see the conversation history of the people you’ve communicated with in the past. That way when someone Tweets your brand, your team doesn’t have to troubleshoot from scratch. Plus you can get to know more about your fans and give your Tweets a personal touch. Have you ever tried to see what people are saying about your company on Twitter? Without a Twitter dashboard, you have to resort to basic Twitter searches for your company name. The information you get from those search results are limited, and you’ll have to run new searches every time you want to see updated information. 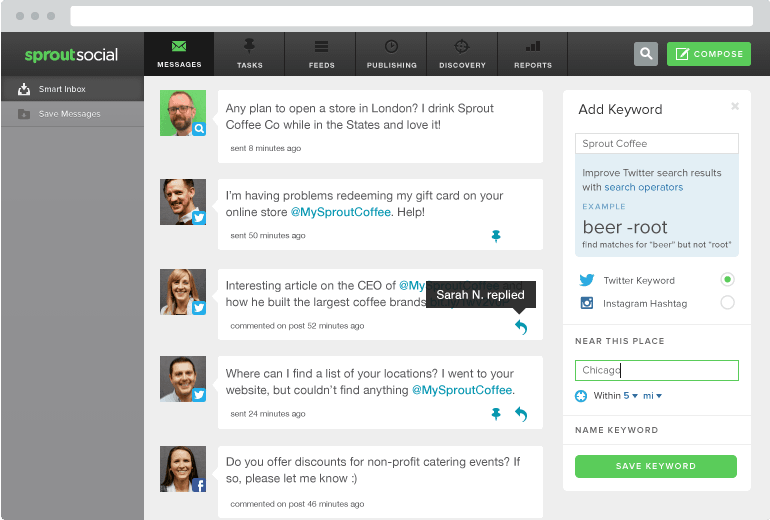 Sprout’s Twitter Dashboard makes it easy to setup searches for anything that you want to monitor conversations about. Instead of just setting up searches for branded phrases, you can get a little more creative and use industry-related terms or trending hashtags you want to monitor. You’ll get real-time updates when people Tweet the phrases you set, so you can respond to them quickly to engage with potential leads, customers and connections. 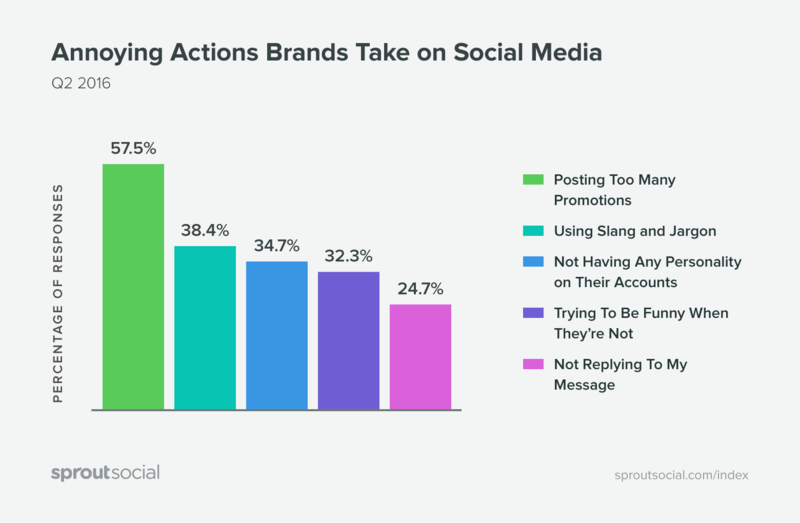 Along with monitoring when your brand is mentioned, Sprout also shows you the most common terms and hashtags people use when they mention you. This will give you a good bird’s eye view of your company’s reputation on Twitter. Engaging with customers and followers is the most important part of being successful on Twitter. 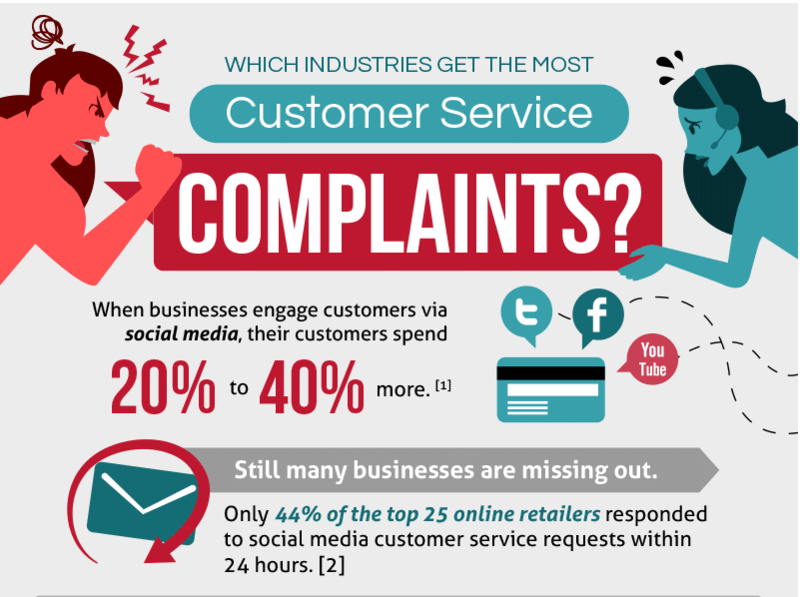 Not only are more customers using social media for customer support issues, but when businesses engage customers on social media, they spend 20-40% more. Can I Just Use Twitter Dashboard? With Twitter rolling out its own dashboard, you may be wondering if it’s worth paying for a premium product instead. 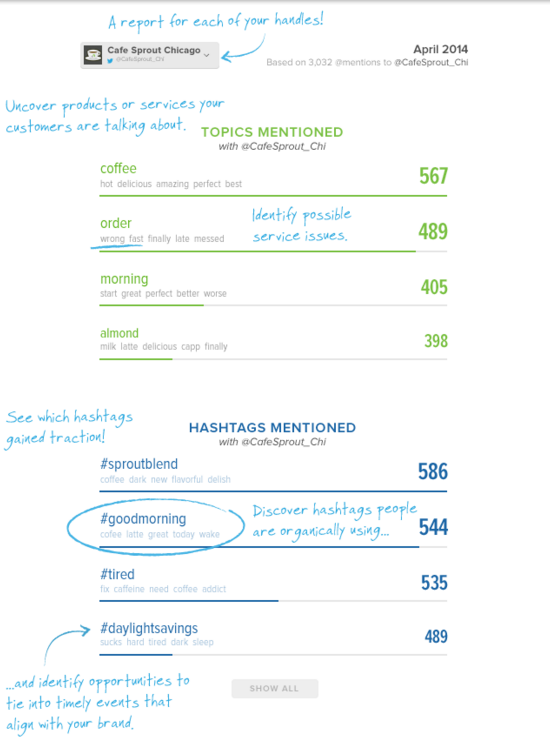 While Twitter Dashboard has some nice features, it’s not as robust as what you get with Sprout. For instance, Sprout comes with ViralPost, an algorithm that picks the best time to Tweet based on when your audience is most likely to engage. Twitter Dashboard lets you schedule Tweets, but you’ll have to use your best judgment for when to send them. You’ll also lose out on our in-depth reporting. Twitter Dashboard gives you some analytics, but it’s not as advanced as what you get with our dashboard. One of the most important reasons to use Sprout’s dashboard is because you can also use it to manage Facebook, Instagram and LinkedIn. Twitter isn’t the only channel your brand is on, so it makes sense to use a dashboard that’ll let you manage multiple social networks. 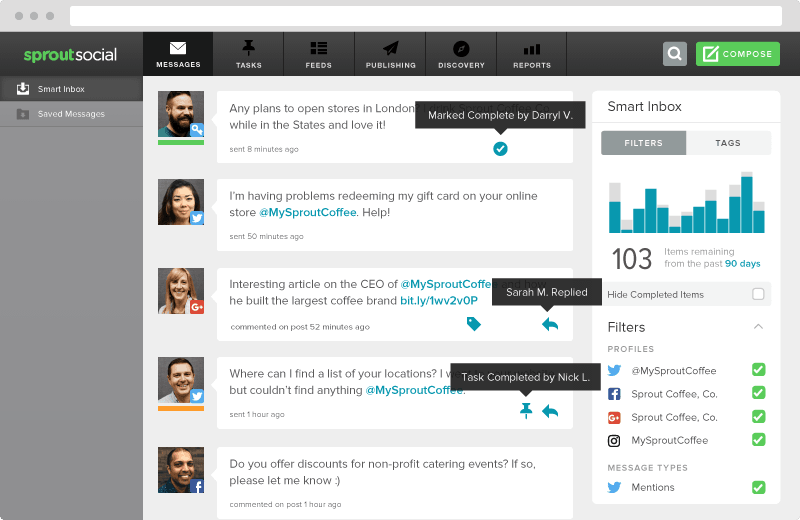 If you haven’t tried a Twitter dashboard yet, give Sprout a try with a free 30-day trial.